Jackie Joyner-Kersee dominated track and field. She’s widely known for her stellar track and field career that produced six Olympic medals, four World Outdoor Championships gold medals and earned her a spot in the National Track & Field Hall of Fame, but giving back to communities across the country is where her true passion lies. In her most recent charitable venture, Joyner-Kersee, 55, has teamed up with Comcast for the second consecutive year to be a spokeswoman for the company’s Internet Essentials program, a comprehensive, high-speed internet adoption program that has served more than 4 million low-income Americans since its launch six years ago. “[Comcast] sought me out, and a lot of it probably had to do with me already doing work in the community,” Joyner-Kersee said. “This fit right in my wheelhouse, and I was very honored to be asked to be the spokesperson. When you talk about Internet Essentials and bridging that digital divide, it’s just really a great program for low-income households and a comprehensive, high-speed internet adoption program. The program, which is entering its fourth round in six years, will allow customers 40 hours of free out-of-home Wi-Fi access per month through Xfinity Wi-Fi hot spots. As of this year, the program will increase internet service speeds from 10/1 megabits per second (Mbps) to 15/2 Mbps and also expand the program to include low-income senior citizens from five cities and metropolitan areas to 12, according to the press release. Joyner-Kersee believes some of the most rewarding moments she’s experienced while working with the program are the reactions from eligible families, which range anywhere from shock to tears. American track and field great Jackie Joyner-Kersee, center, jogs with Palestinian women in the West Bank city of Ramallah, Thursday, April 17, 2014. 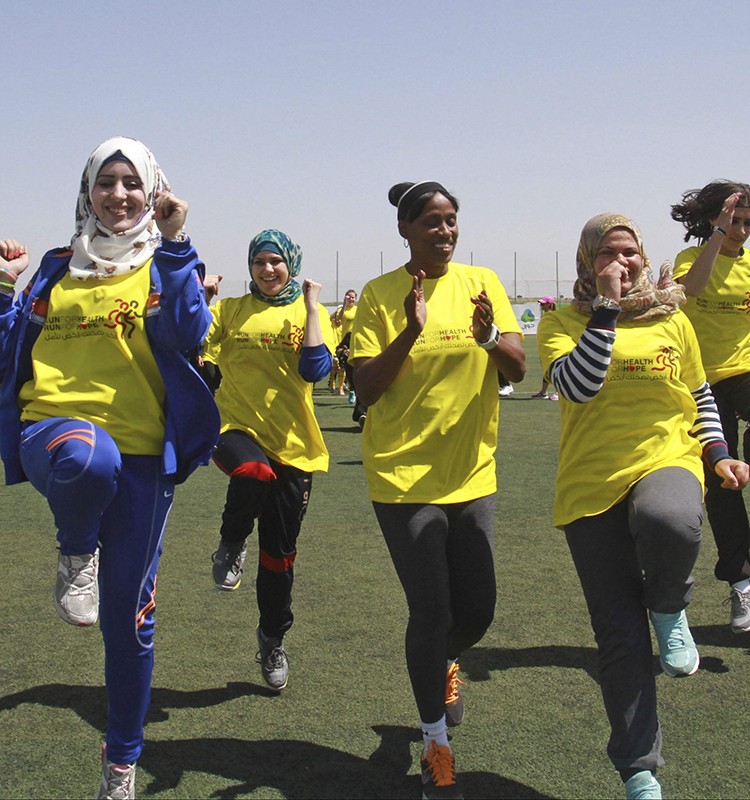 The three-time Olympic gold medalist visited the West Bank to encourage Palestinian women to be physically active. Donating time for a greater cause isn’t a new concept for Joyner-Kersee, who made it a point to invest in her community long before she became a track star. As a young girl, Joyner-Kersee said, programs she took part in stressed the importance of giving back, whether it be time or money. Community service and Joyner-Kersee’s track and field career were both top priorities that demanded long hours and solid commitment, yet Joyner-Kersee balanced the two seamlessly. After graduating from high school, Joyner-Kersee attended UCLA on a full basketball scholarship after turning down a track scholarship from the school. Although Joyner-Kersee earned All-America honors as a basketball player, she began training for the heptathlon in hopes of making it to the Olympics. During track and field events, Joyner-Kersee’s work ethic and athletic ability spoke for her. At the 1984 Olympic Games, Joyner-Kersee was a silver medalist in the heptathlon, and she returned in 1988 to earn gold medals in the heptathlon and long jump, setting a world heptathlon record of 7,291 points that still stands today. That same year, Joyner-Kersee founded the Jackie Joyner-Kersee Foundation in an effort to provide those in need with resources to better their situations. The foundation would also cater to residents of East St. Louis, Illinois, Joyner-Kersee’s hometown. 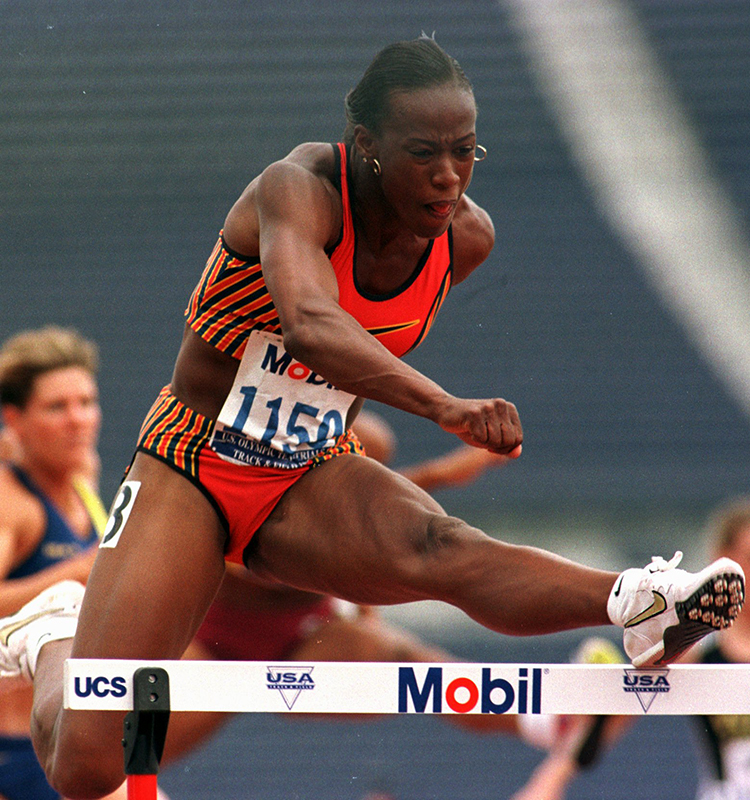 In 1992, Joyner-Kersee earned another gold medal in the heptathlon, and bronze in the long jump. In 1996, in what would be Joyner-Kersee’s fourth and final Olympics, a hamstring injury forced her to withdraw from the heptathlon, but she still managed to earn a bronze medal in the long jump. Jackie Joyner-Kersee competes in the women’s heptathlon, the opening event in the U.S. Olympic track trials, in Atlanta, Friday June 14, 1996. Joyner-Kersee, the favorite to win the event, won her heat. In 2000, the Jackie Joyner-Kersee Center was built in East St. Louis after the foundation raised $12 million for the 41,000-square-foot facility. The center would be used as a premier venue for youth recreation and sports. Joyner-Kersee officially retired a year later at age 38. Now, Joyner-Kersee is all in. Outside of her work with the Internet Essentials program, Joyner-Kersee is still hosting events through her foundation. She is now gearing up for the foundation’s largest event, the fifth annual Sequins, Suits & Sneakers Gala, which will take place in St. Louis on Oct. 26. Although Joyner-Kersee enjoys being considered one of the greatest female athletes of all time in her sport, it feels even better to be known for her work in the community.